When you are using a roof harness system you need to make sure that you keep some basic things in mind as they would make sure that you stay safe when you are working at that kind of height and on such a structure. The first thing that you need to do in this regard is to put some money in roof brackets. Not only would it make you a lot safer, but it would make it easier for you to work as well. A roof harness system comes in extremely handy when you are working on a roof that is really steep or if you have to spend a lot of time over there. 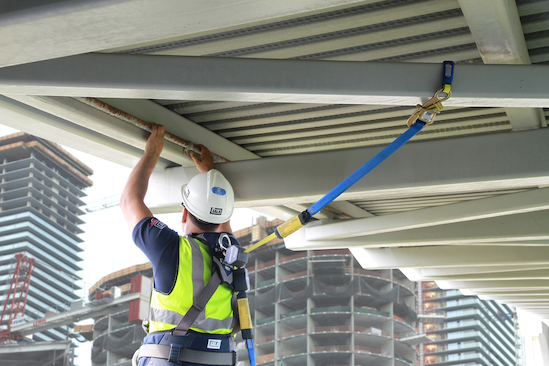 It is said that a roof harness system is next only to a parachute when it comes to overall safety. The first thing that you have to keep in mind in this particular regard is to put on your safety harness properly. This should ideally be done as per the instructions mentioned by the manufacturers. Tighten the straps in such a way that they fit you comfortably. Before you head to the roof make sure you have double checked all the buckles. Then you would have to attach the roof anchor with the peak. Once again this has to be done exactly as the manufacturers have asked you to. You can use screws through your roof boards and into the rafters as well if you wish to. Do make sure that the holes in these cases are predrilled. After that, tighten the screws by using a wrench. After this, you have to clip the safety rope’s end to the ring that is there on the roof anchor. After this, you would have to clip the lanyard and D ring that is back there on your harness. The rope-grab needs to be squeezed and slid along the safety rope. This will make sure that the lanyard gets repositioned on the rope even when you are doing your work or moving around the roof. You need to make sure that the roof anchor has been fastened in a secure manner to solid wood such as a rafter, a ridge, or a truss beam. Just fastening them through plywood or roof boards would not be sufficient in these cases. You also need to keep in mind that the models in these cases are not always the same. They tend to vary with respect to the makers. So, when you are using them, do read the instructions of the manufacturers really carefully. You need to follow them properly as well. Always check if there is any loose stitching on the lanyard or the harness itself. Also, see if any webbing on those two has worn out or not. If a harness has ever seen a fall never use it again. The same goes for a lanyard as well. Always send it back immediately to the maker so that it can be inspected and then appropriate actions could be taken.